In the past, I have spoken in a few churches where someone has begun extolling the “biblical scholarship” of Gail Riplinger. Whatever else may be said, she is not a biblical scholar and she has introduced confusion and error into churches. You should encourage fellow believers, especially novices, to avoid her false teaching. Last week I finished preparing my textbook list for Rapid Hebrew Reading. This is a class that I will teach in the Fall Semester of 2008 (to read about this, scroll down to course number 149 on this page). The reading in this class covers forty-five chapters from the Hebrew Old Testament dealing with pericopes in historical narrative, legal material, prophecy and poetry. Because of the demands of this type of class, I was glad to add a unique Hebrew Bible that I am confident will assist in covering our objectives in this class. 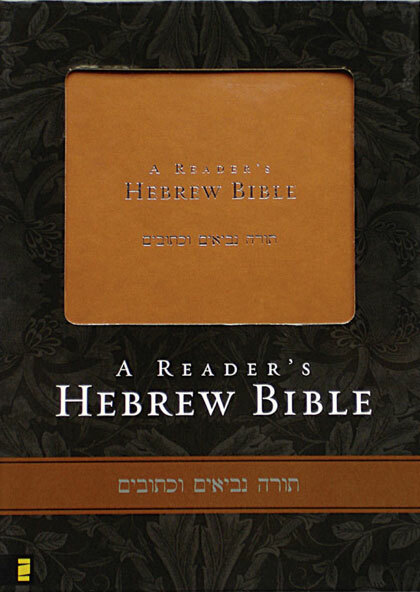 The new tool is Zondervan‘s A Reader’s Hebrew Bible edited by A. Philip Brown II and Bryan W. Smith. In my estimation, this is a great source for stimulating reading the Hebrew Old Testament. Earlier this week, Tuesday, April 15, the ESV Bible Blog announced that the ESV Study Bible would be released in October 2008. If you go to the ESV Study Bible’s home page, the menu is set up so that you will be able to easily examine this study Bible’s features, formats, contributors, and endorsements. The Features page provides an overview of its content and features. Some interesting features include more than 25,000 notes that focus on interpreting the biblical text and 80,000 cross references to easily locate key terms, passages and biblical motifs. Also, while on this page, you can see sample portions of John 1 & John 18 and an illustration of Solomon’s Temple. The Formats page provides details about the printing and binding. When on this page, you can pre-order, with a 35% discount, the ESV Study Bible in eight first-edition formats. On the Contributors page, it is noted, “the ESV Study Bible was created by a team of 93 outstanding evangelical Bible scholars and teachers. They were chosen, first, because of their deep commitment to the truth, authority, and sufficiency of God’s Word; and, second, because of their expertise in teaching and understanding the Bible.” The final menu item is its Endorsements. Here you can see what a few evangelical leaders have to say about the ESV Study Bible. Dr. Albert Mohler’s response to this study Bible is worth noting: “Outstanding! The ESV Study Bible is a treasure—a beautiful volume, filled with a wealth of resources. It will be just as useful for the seminarian and long-time pastor as it will be accessible to the brand-new Christian” (for a range of blog responses, go to ESV Study Bible Blog Responses). Judging from what I have been able to review, the ESV Study Bible will make a great contribution to the range of study Bibles (for my assessment of the ESV Literary Study and how I use translations, click here). After finishing my investigation of the ESV Study Bible, I returned to the Formats page to order my copy with a 35% discount. I look forward to receiving my copy of the ESV Study Bible in October and recommend that you go to ESV Study Bible and order your copy today so that you can also receive it when it is released. A week ago, I received the much-anticipated ESV Literary Study Bible (ESVLSB), and I wanted to post some of my initial reactions to this new study Bible. As many of us know, this is not the first edition of the English Standard Version. Rather the ESV was first published in 2001 and, at that time, I received a copy of it. After a few years of dabbling with the ESV, I began to use it more consistently in 2004. While holding a Bible conference in 2005 at a church that used the ESV, I purchased ESV: The Reformation Study Bible. Subsequently, I began to use the ESV as my preferred literal or formal translation, though I use many other versions since all legitimate translations reflect a substantive preservation of the autographs. Since I teach Hebrew, I encourage my students that, after they have done their own complete original translation, they should consult three different types of translations to check their work. They should begin with a Bible that uses a formal equivalence translation philosophy, such as the ESV or NASB. Next, they should check a functional equivalence Bible, such as NLT or CEV, and then a Bible that is somewhere in between these two translation philosophies, such as NIV or NET Bible. These last two types of translation should assist them in refining their own English translation. Since I am committed to the original language texts that undergird all acceptable translation work, my commitment in the Old Testament is to Biblia Hebraica Stuttgartensia and in the New Testament to the Greek New Testament (UBS4) (though my knowledge of Greek is not the same as when I did my doctoral work). However, because my knowledge of Hebrew is more a grammatical understanding, rather than an intuitive knowledge of the language, my own oral translations are more often than not coordinate with a rendering that is similar to the ESV. When I first read about the ESV Literary Study Bible, I had some favorable expectations because of the two editors, Dr. Leland Ryken, Clyde S. Kilby professor of English at Wheaton College, and his son, Dr. Philip Graham Ryken, senior pastor at the historic Tenth Presbyterian Church in Philadelphia. For those who have taken any of my classes related to Old Testament poetic literature, Dr. Leland Ryken’s name should bring to mind favorable memories since I require my students in these types of classes to read a few of the books that he has written. One of my favorites is Words of Delight: A Literary Introduction to the Bible. Over this past week, I have been reading segments from Job, Psalms, and Ecclesiastes. My initial reactions have been positive. While this is a study Bible, it is not the same as other study Bibles that I have used (for example, NAS Ryrie Study Bible, NIV: Study Bible, The MacArthur Study Bible, and ESV: The Reformation Study Bible). Like other study Bibles, ESVLSB contains a commentary on the biblical text; however, what is different is that ESVLSB places its comments as headnotes rather footnotes. In addition, the headnotes do not focus on the types of comments other study Bibles have, but rather on giving the reader reflective notes about the genre of a given text and its structural unity, as well as developing other significant rhetorical features. 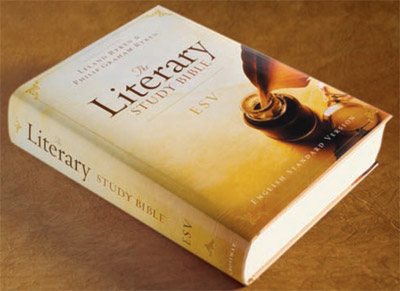 Furthermore, ESVLSB provides an introduction to each book that focus on the following kinds of issues: general information about the book, genre, key motifs, stylistic and rhetorical features, issues that relate to human experience, the development of a book’s message as well as how a specific book’s message relates to the overall message of the Bible. Another beneficial feature is the “Glossary of Terms and Genres” at the end of book on pages 1883-1900. One final positive item is that you can currently receive a 40% discount if you order this study Bible from Westminster Books. Since my objective is only to give my preliminary impressions of Job, Psalms, and Ecclesiastes, you’ll want to read what others have said for a more thorough review of ESVLSB. Endorsements for this study Bible may be found at Between Two Worlds and Dispatches from the Post Evangelical Wilderness. You may also want to read a couple of interviews with both Dr. Leland Ryken and Dr. Philip Graham Ryken at Mongergism.com and at Westminster Bookstore Blog. Initially, I thank God for tools, like ESVLSB, that divine providence has made available for us to effectively study Scripture. Since I still have 63 other books in ESVLSB to read, these are only my initial thoughts. Since ESVLSB‘s notes for Job, Psalms and Ecclesiastes are a delight to read, I anticipate that my trek through the remainder of this study Bible will be equally profitable.